A clear, precise, and comprehensive book that will give children the tools to build confidence in reading, writing, and comprehension through visual explanation. 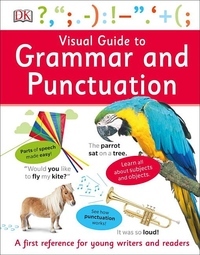 From when to use a preposition or pronoun to how to use a comma or colon, Visual Guide to Grammar and Punctuation covers all the most important grammar topics in DK's signature style. Each example provided is supported by a picture, making it accessible and comprehensible, and clear and simple text and repetition help to solidify knowledge and understanding. Visual Guide to Grammar and Punctuation will improve a child's confidence in using the building blocks of reading and writing, and is a book they will refer to again and again.